A Balkans Blitz? We called it that because we moved pretty quickly through all the countries on that peninsula… eight of them for our tour. …the other six countries we visited were part of the former Yugoslavia. The former Yugoslavia was slightly less than 99,000 square miles. That’s roughly the size of the U.S. states of Wyoming or Colorado. Now it’s divided up onto those smaller nations. Why so many small states? Well, you have to look at the history of the area. At one time or another, each of those small states was a superpower of sorts in the area. The history is complicated. It comes partly from being a crossroads between east and west. That’s a tough one…. which countries are considered as part of the Balkans depends on who’s counting them and why. 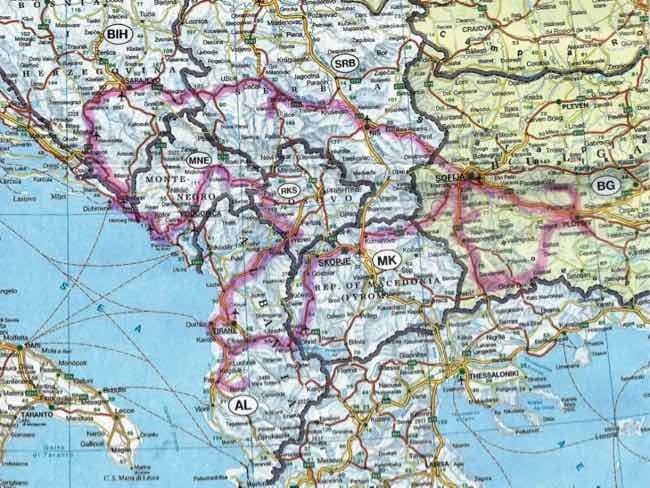 The Balkans are usually said to be comprised of Albania, Bosnia and Herzegovina, Bulgaria, Croatia, Kosovo, the Republic of Macedonia, Montenegro, Romania, Serbia and Slovenia. We touched on eight of them. Greece is certainly on the Balkan peninsula, but is most often excluded as is Turkey as being part of the Balkan countries. The area was settled by Thracians in 5th millennium BC. Then Philip II of Macedon, Romans, Huns, Slavs, Byzantines, Bulgars, Ottomans… and I think he forgot Illyrians, Paeonians, and Dacians… In modern times, Yugoslavia tried to unite many of them, but that broke apart in the 1990s. Now can you understand? Maybe not. Not sure we do! Sofia was where the tour started. We went a week early so we could explore Bulgaria on our own. 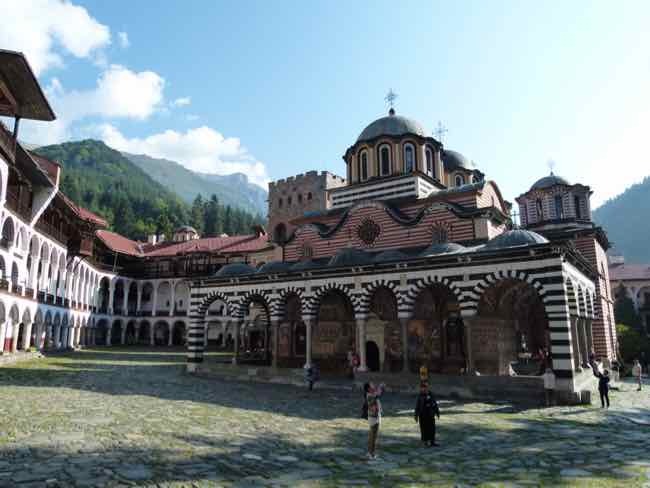 We rented a car and drove first to Rila Monastery which is considered one of the symbols of Bulgaria. 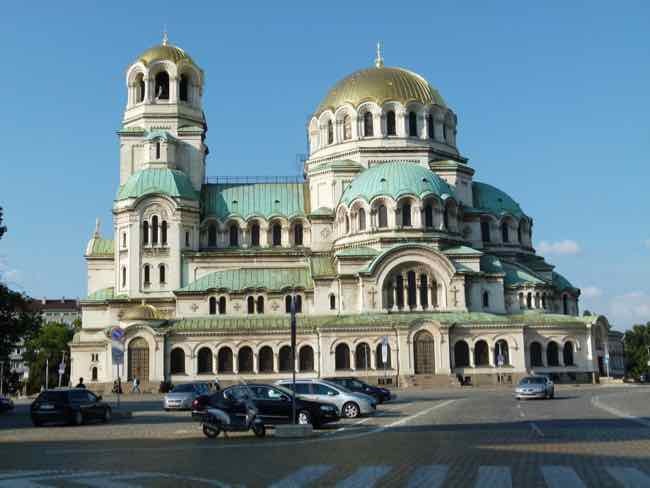 It is important to the Bulgarian people as it symbolized their Slavic cultural identity after centuries of occupation. 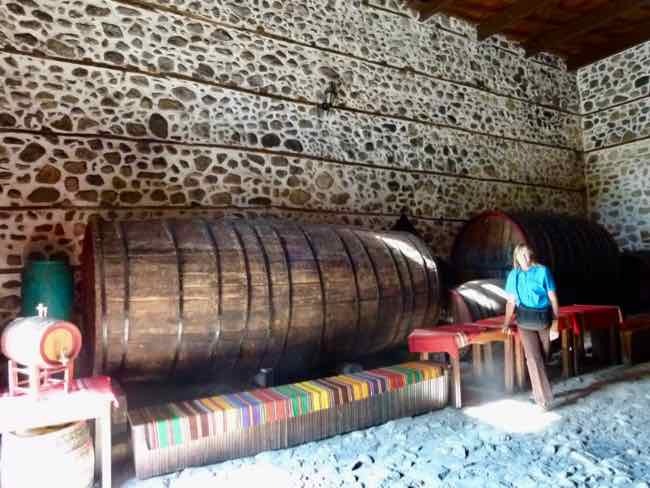 It’s in a beautiful remote mountain setting and has beautiful frescos. It is one of those churches that you really should not miss… even when you get to the point of saying, “No more churches!” And it’s free to visit. A couple of hours driving south took us to the cute town of Melnik in a wine growing region. It is Bulgaria's smallest town, but it's very lively with tourists from all over. The Pirin Mountains around it have interesting sandstone pyramids. That sandstone is great for cellars under the houses too. 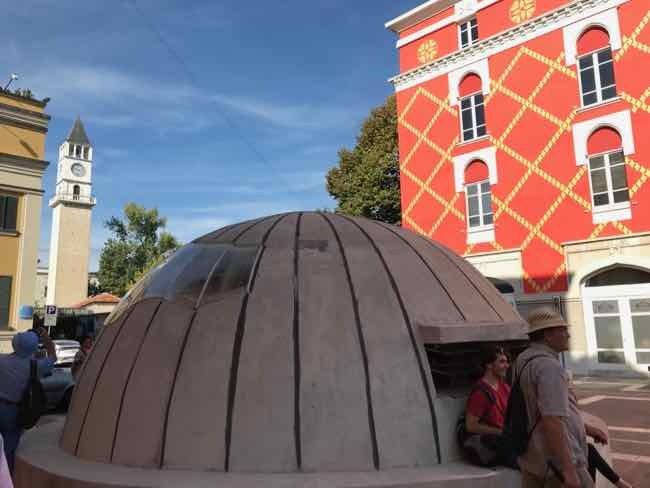 The architecture in the town is interesting…. most houses are built in the Bulgarian National Revival style with lots of windows and balconies. The whole town is an architectural reserve. The wine is good. And so is the food… good and very inexpensive. There are lots of mountain roads through the middle of Bulgaria. 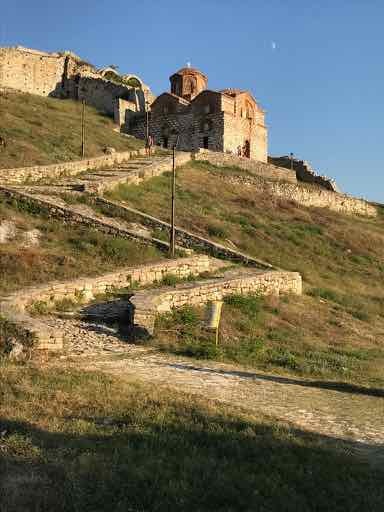 We drove those and visited more monasteries, then ended up in Plovdiv and Hisarya. There was interesting architecture and Roman ruins in both cities. And Thracian Tombs to visit a bit beyond Hisarya. Back in Sofia the city is very manageable (without our car now!). It’s known for its Orthodox churches and for its Roman ruins. Remember what I said about all the layers of history here. 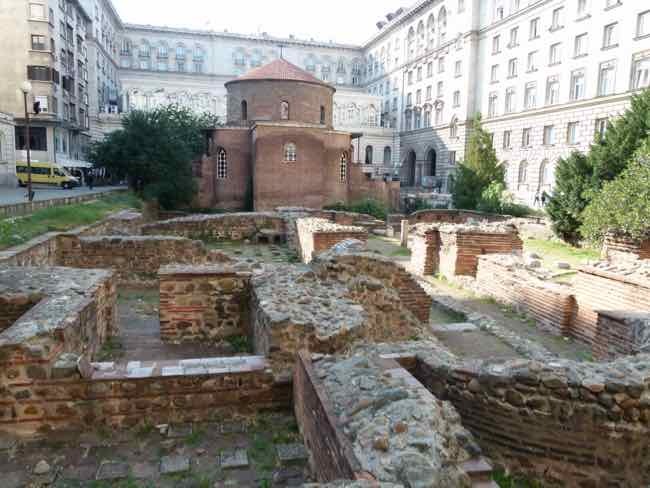 Rotunda of Sveti Georgi is an Early Christian red brick rotunda that is considered the oldest building in Sofia. 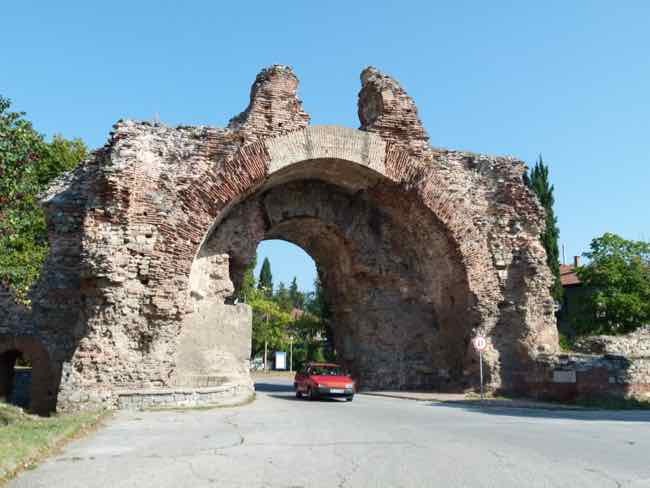 It is situated behind a hotel amid remains of the ancient town of Serdica. ...and getting through the mountains and across all those borders in the Balkans didn't sound easy. This tour concentrated on historic capitals, monasteries and seaside towns... not the modern capitals... and that was OK with us. We stopped in the medieval capital of Krusevac. It was built in the late 14th century by Prince Lazar. Remember that complicated history? 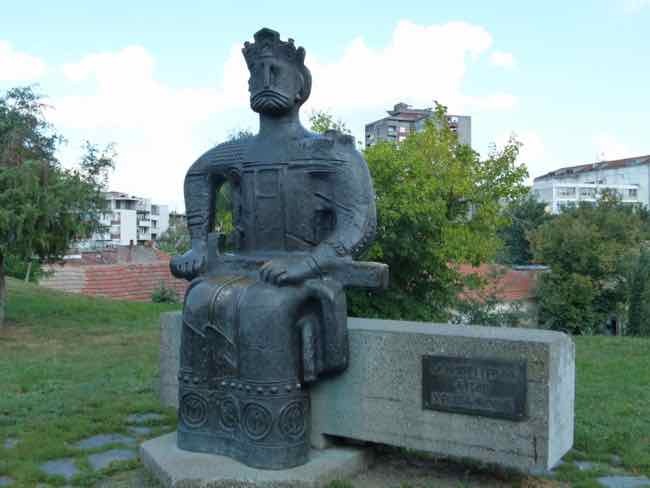 Prince Lazar tried to keep the Serbian Empire going as it was crumbling…. and it wasn’t long before it fell to the Ottomans. There are churches, the ruins of his fortress, and this handsome statue of the Prince. We spent the night at a modest guest house at Studenica Monastery. It was very comfortable, but we did sort of feel like monks! 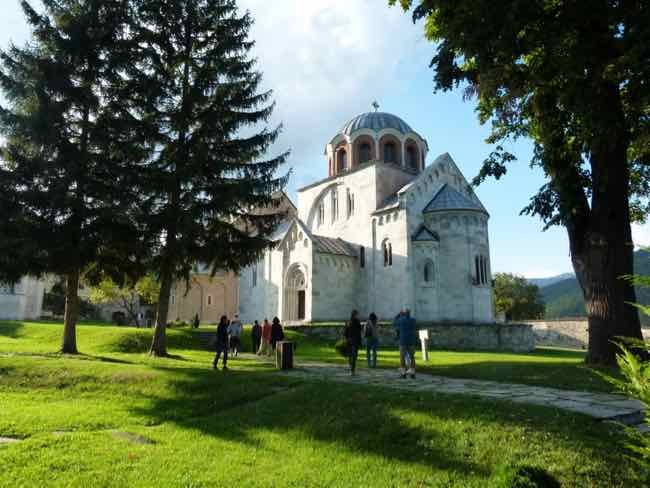 Studenica was established in the 12th century. It is the largest and richest of Serbia’s Orthodox monasteries. The monks have regular services. We listened to the evening service… the chanting was amazing. The capital is Sarajevo. 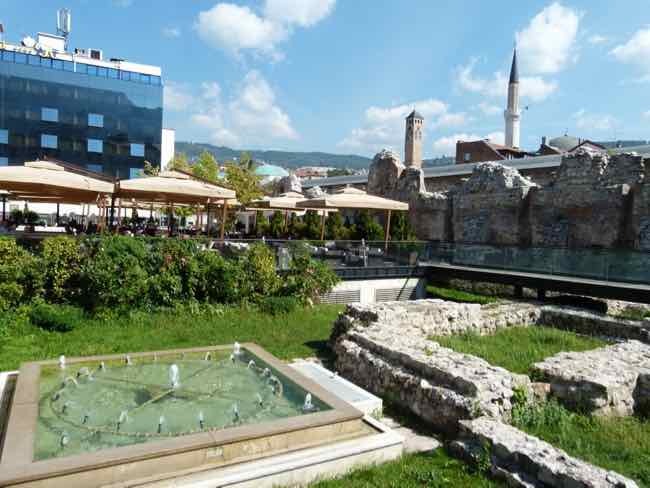 As in all of this Balkans area, there are layers of history. 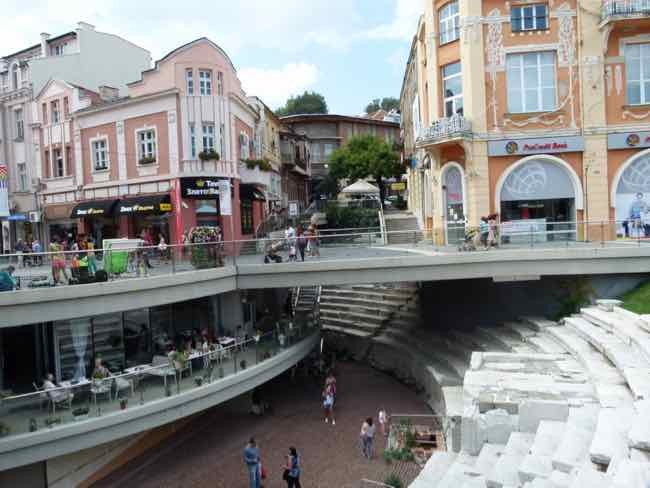 The heart of the old town is Bascarsija Square also known as Pigeon Square…. you can guess why. 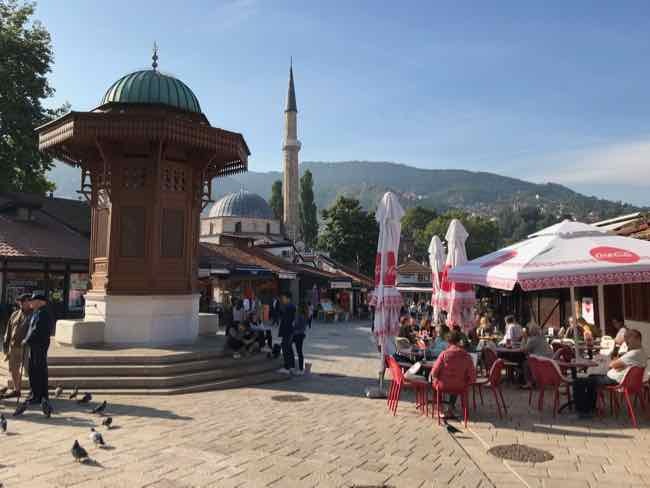 This area was Sarajevo’s old bazaar. This part of town reflects the Ottoman influence. If you wander towards the newer part of town, you actually see some of the older layers too… Roman ruins and remnants of old caravansaries. 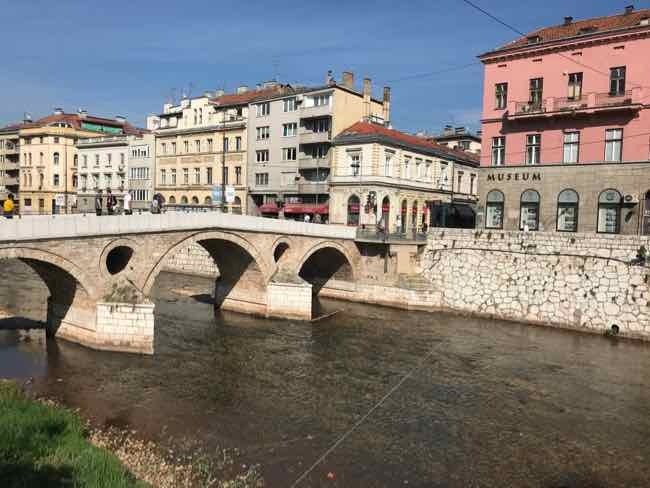 The Latin Bridge in Sarajevo is the oldest among the preserved bridges of this city. The other bridge is the reconstructed bridge in Mostar. The original bridge was built in the 16th century and stood for 427 years. 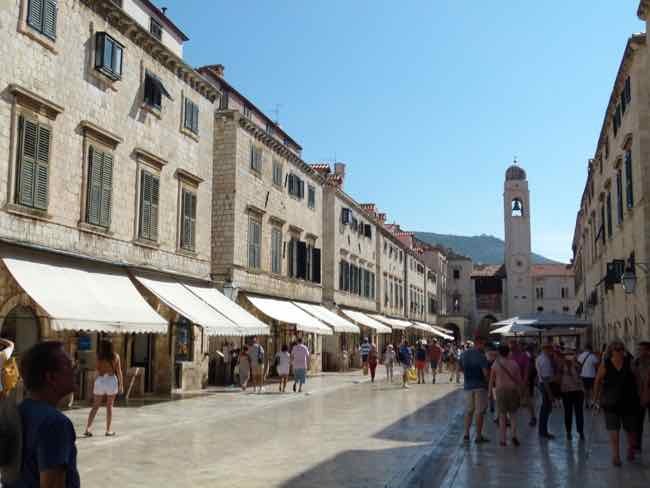 It was destroyed in the wars that ensued when Yugoslavia broke apart. 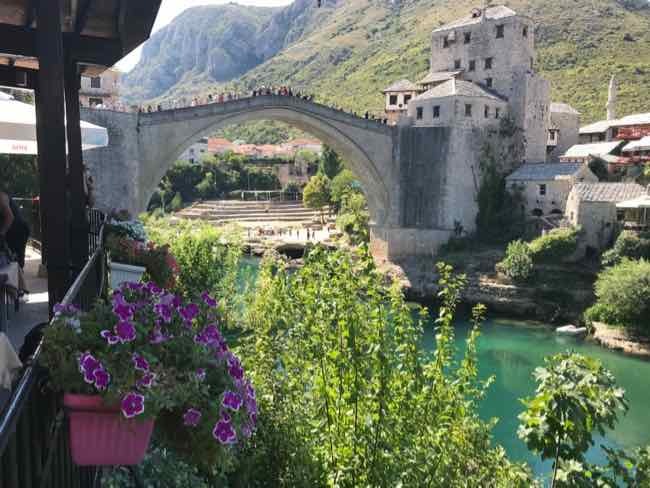 The little town of Mostar has become quite a tourist attraction. Whew… when we were there we could hardly move in town or on the bridge for the crowds! 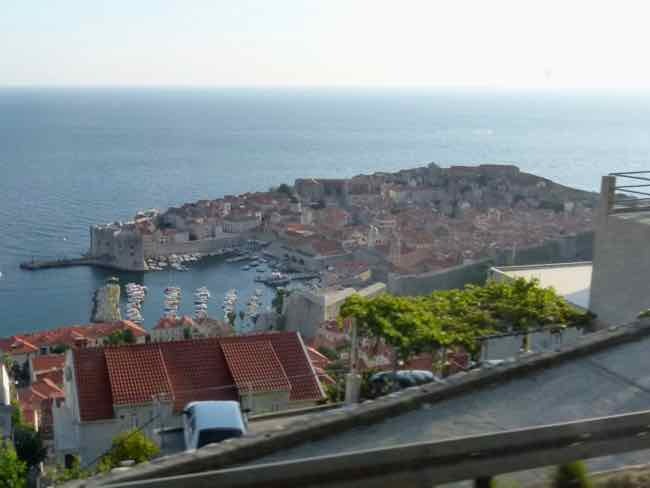 We drove over more of the mountains that make up a large part of the Balkans and dropped down into Dubrovnik. It really is a little jewel of a walled medieval city. 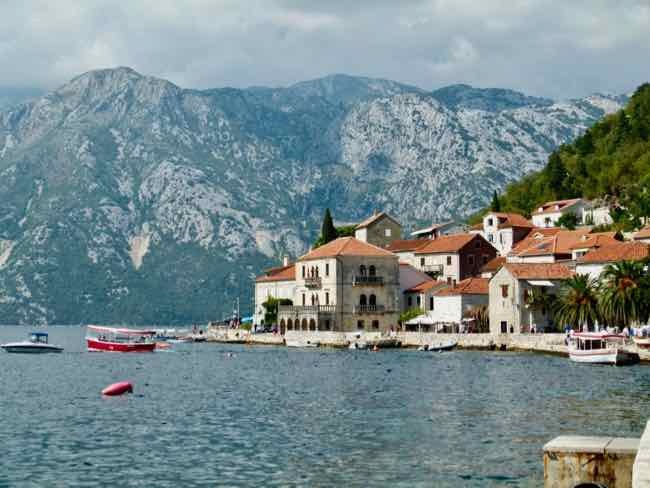 It’s easy to see why it’s called the Pearl of the Adriatic. When we first went, years ago, we stayed in a B&B inside the old town… and we had it pretty much to ourselves. Now, it is often very crowded. Just try to time your visit for a day when they don’t have 3 or 4 or 5 of those big cruise ships in! We were lucky this time too. We could move around just fine on the main street. On this visit we stayed at a hotel about a 15 minute walk from the main gate. That gave us a chance to see that there is much more to Dubrovinik than just the old town. 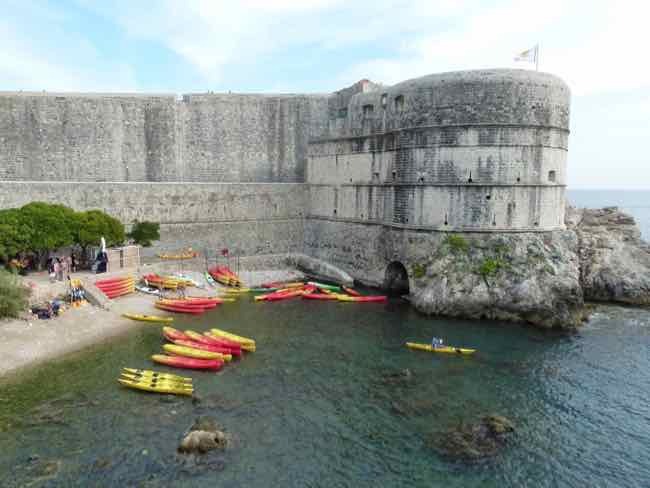 You can swim and kayak just outside the walls. A bit further out, is Sunset Beach which is great for swimming. It's about a 20 minute walk from the Old Town. There are several hotels in that area. 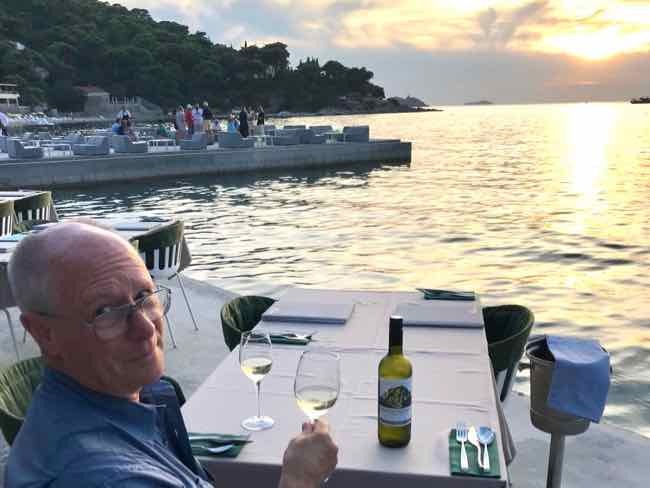 There are also many nice restaurants for dinner… at sunset of course! Over more mountains and we came to Herceg Novi. 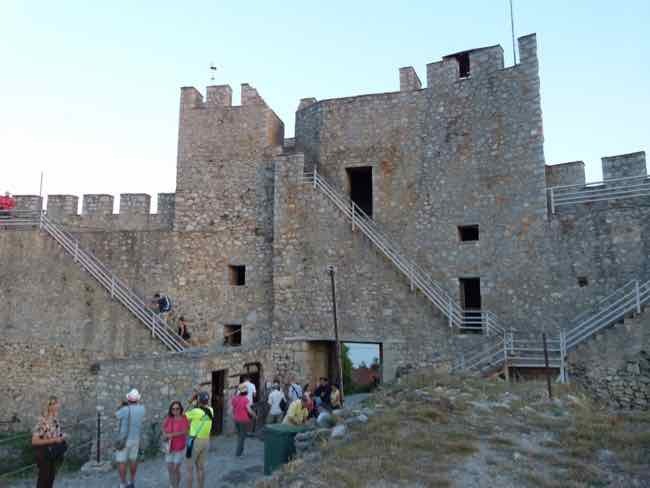 Herceg Novi means New Castle in Montenegrin. 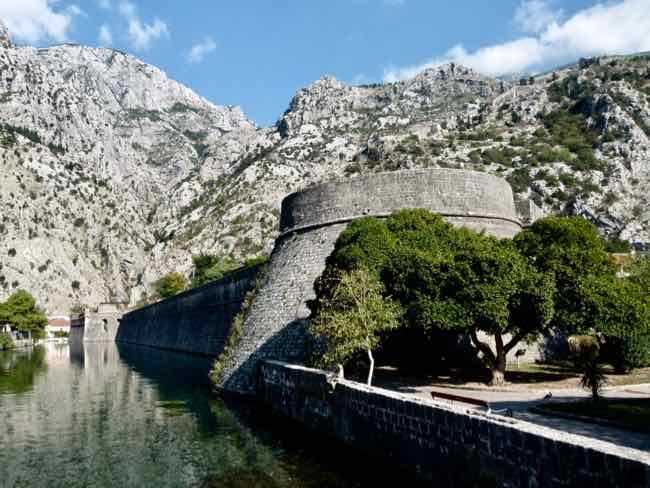 It sits at the entrance to the Bay of Kotor and tumbles down to the water. 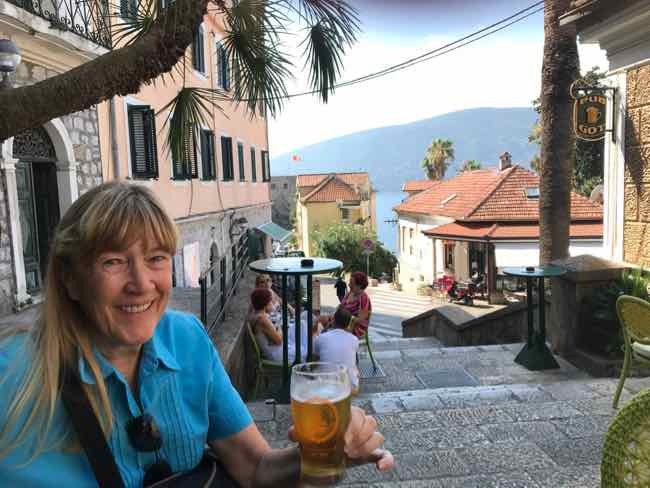 Driving around the bay, you come to Perast which has lots of waterside restaurants. There are churches to visit on the islands out in the bay. Cruise ships full of tourists head for Kotor. 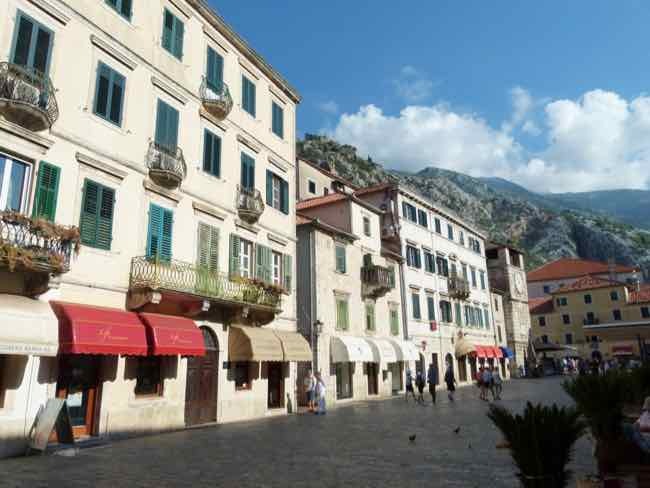 Wedged between the mountains and the bay, it is a well preserved walled city…. 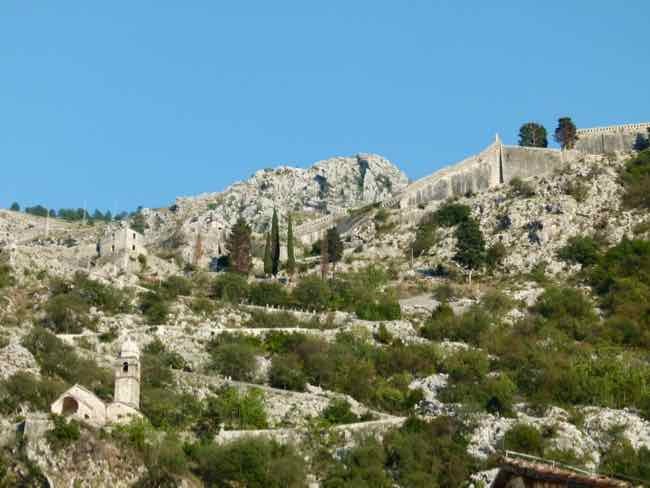 ...but it’s medieval walls snake up the surrounding hills like nothing we’ve ever seen before. If you want to get your exercise, hike up to the top of the walls. 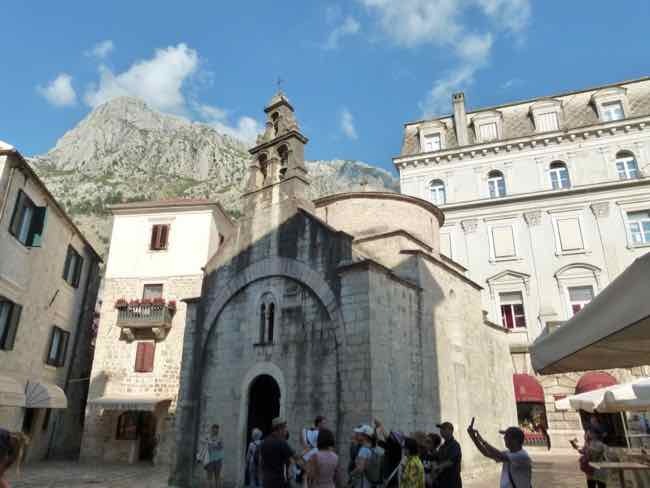 Like all old cities of the Balkans, Kotor has a complicated history. Probably founded a couple of millennia ago. The Romans were there, then the Bulgarian Empire, and the Serbians. Then came the Venetians, the Ottomans and on and on. The pedestrian only streets of the city are full of delights… churches, fountains, restaurants. There are other coastal cities in Montenegro… but we were off again. Remember this is a blitz through all those new little nations in the Balkans. Our drive to get from Montenegro to Kosovo took us all day through more mountains and the breathtaking Tara River Canyon. 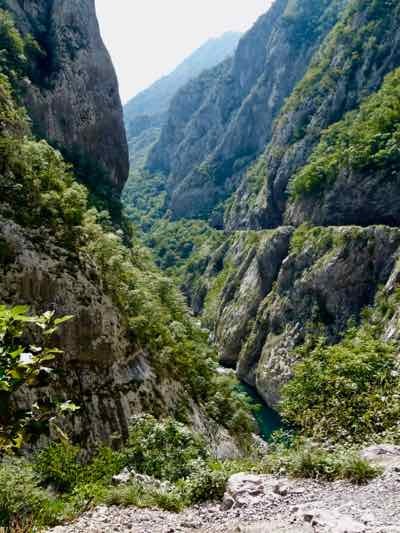 The Tara Canyon is one of the deepest river canyons in Europe. We spent the night in a pleasant but unremarkable border town. 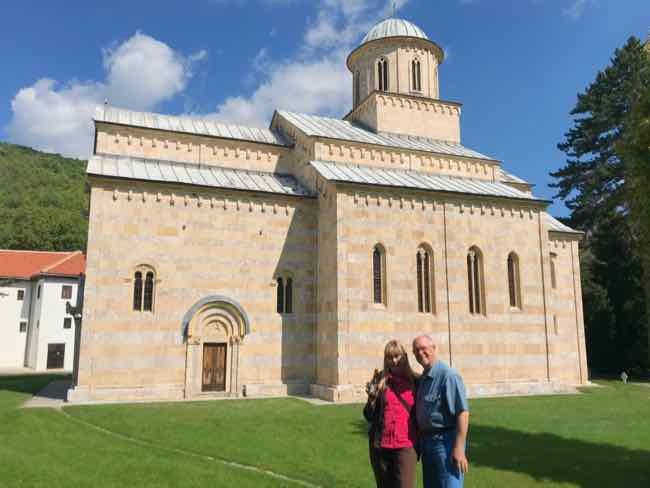 The next morning we headed for Visoki Decani Monastery which was built in 1327. It is a Serbian Orthodox Church… Kosovo is 96% Muslim. 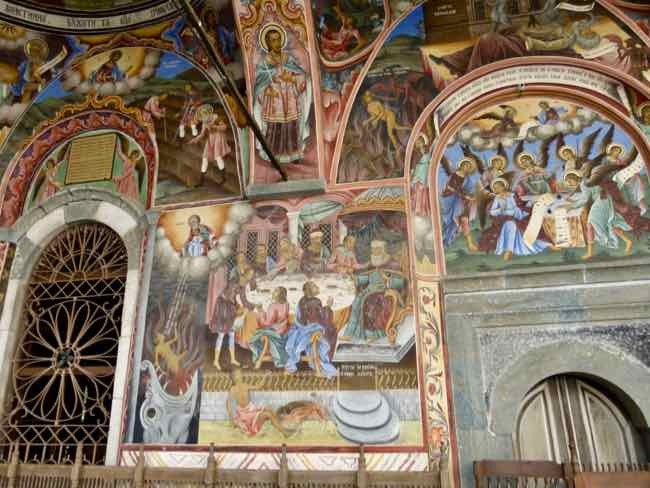 During the war in the 90s many Christian churches were destroyed in Kosovo, but this monastery church was not damaged. We had to show our passports to get in.... almost like passing a border again. It is guarded by something called KFOR.... NATO has a special force from Kosovo guarding it, still, for fear of attack. The highlight of the church is hundreds of beautiful frescoes inside… they are all original from the 14th century and deserve to be protected. About 25 Serbian monks live in the monastery… they make monastery beer… We tried some, and it would be a shame to lose that too. After all that driving through the mountains of the Balkans, we drove through flat land with lots of agriculture for a couple of hours. 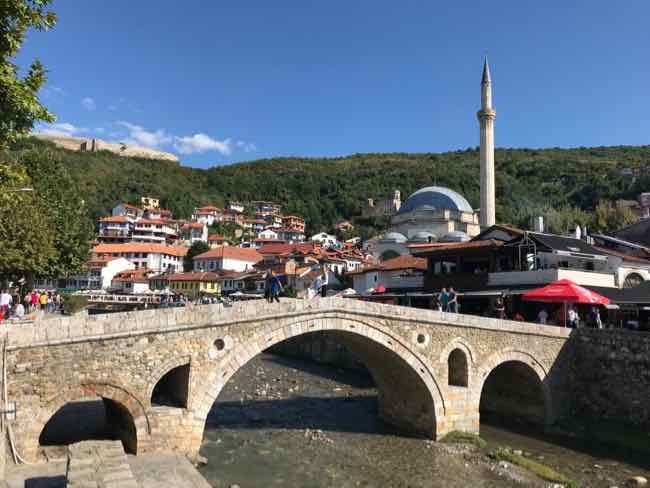 Picturesque Prizren is Kosovo's second city and it shines with post-independence enthusiasm that's infectious. We were there on a Sunday, and it was a very lively scene along the river. Albania was never part of Yugoslavia… it was a reclusive state during the Cold War Era. They don’t call themselves Albania… it is Shqipëria in Albanian. There are bunkers all over the country that were built during the rule of Enver Hoxha. 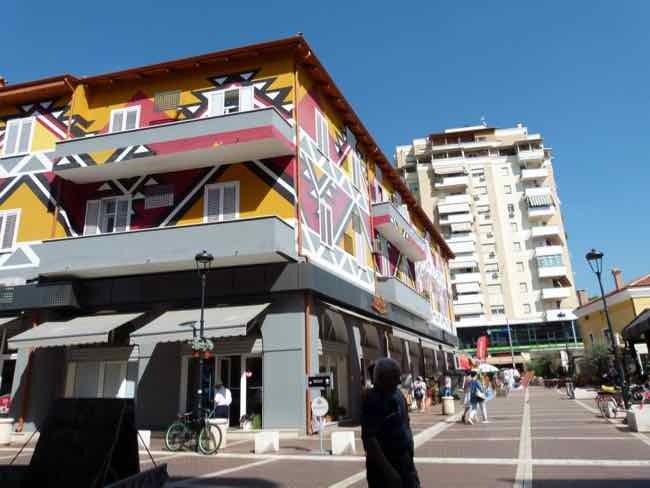 In Tirana, a couple of them have been turned into museums called Bunk'Art 1 and Bunk'Art 2. Statues from that era have been relegated to the back of the National Gallery of Art, and ugly buildings from that dark time are being repurposed. and the buildings are brightly colored. Even traffic stop/go light poles change from red to green when the lights do! 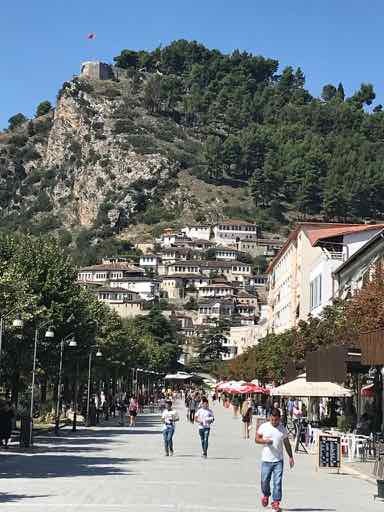 A nice little city with a castle on the hill and white Ottoman houses marching up the hill with a great pedestrian street. It’s known as the "city of a thousand windows" for all the windows in those houses. 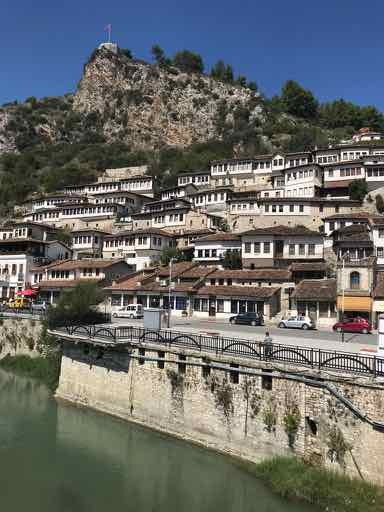 Berat Castle on the top of the hill dates from the 13th century… We drove up and back and still had quite a climb inside the castle! But it was worth it. There are plenty of good restaurants, some with a view of the castle, the river and those Ottoman houses. Officially the Republic of Macedonia… but there is an ongoing dispute with Greece over the name, and so it is provisionally known as the Former Yugoslav Republic Of Macedonia. We thought that had been resolved when we went… but apparently it hasn’t. The capital is Skopje which we only skirted. 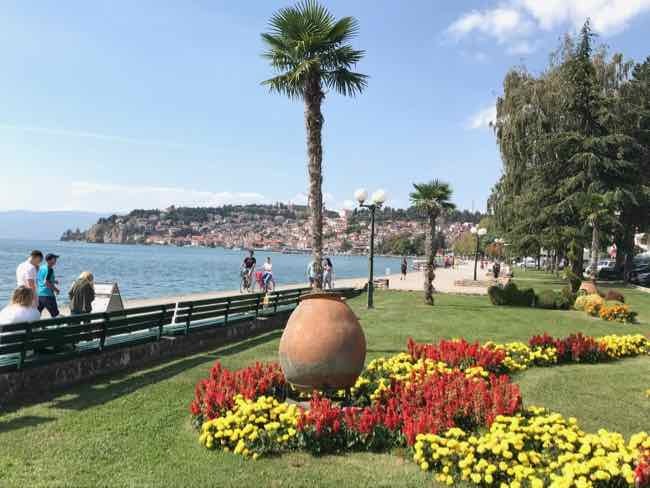 We went to Ohrid which has a beautiful setting on Lake Ohrid. 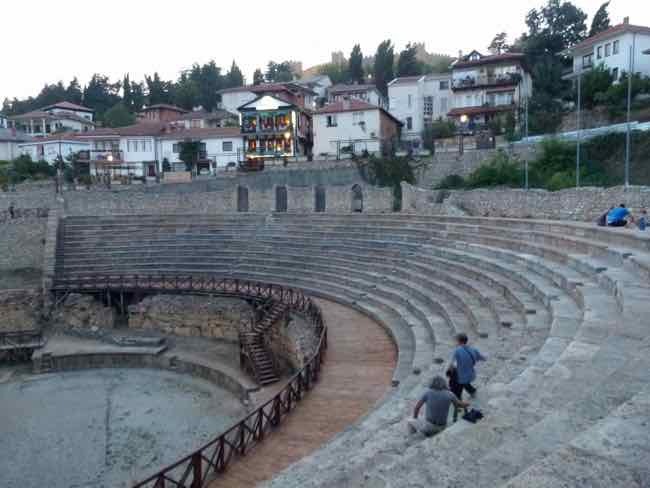 Ohrid has everything you want in a tourist town…. a beautiful lake, and interesting old town, medieval churches, Roman ruins, and a great ancient fortress on the hill. Are You Ready For The Balkans? We told you this was a blitz through the Balkans. The food was good and inexpensive. Hotels were nice and also inexpensive. The biggest problem hitting so many countries in such a short time was the currency. Most have their own currency. Only two are on the Euro. Some of the others accept Euros. We found that we could use credit cards almost everywhere. We covered eight Balkan countries. They are small countries, but those mountains make getting from one to the other slower going than you might think. 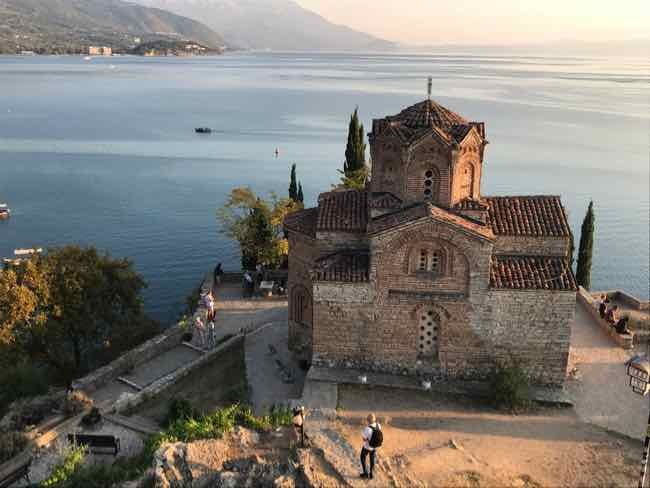 And if you go, you might not want to move along as quickly as we did, but however you do it, we’re pretty sure you will enjoy a trip through the Balkans.